Make an Ondestrak! #MusicMonday « Adafruit Industries – Makers, hackers, artists, designers and engineers! The Ondes Martenot was one of the world’s first electronic instruments. Like many other early electronic instruments, such as the Theremin and Trautonium, the Ondes Martenot gave the player control of a continuous band of pitches. There were no stops or keys, but rather a device that allowed for an uninterrupted glissando. They were the electronic equivalents of a trombone or slide steel guitar. What made the Ondes Martenot unique compared to its more popular cousin, the Theremin, was that it was a tactile instrument. As anyone who’s ever played with a Theremin can attest to, they can be difficult instruments to play with any sort of intuition or accuracy because there are no physical markers to gauge one’s actions with. 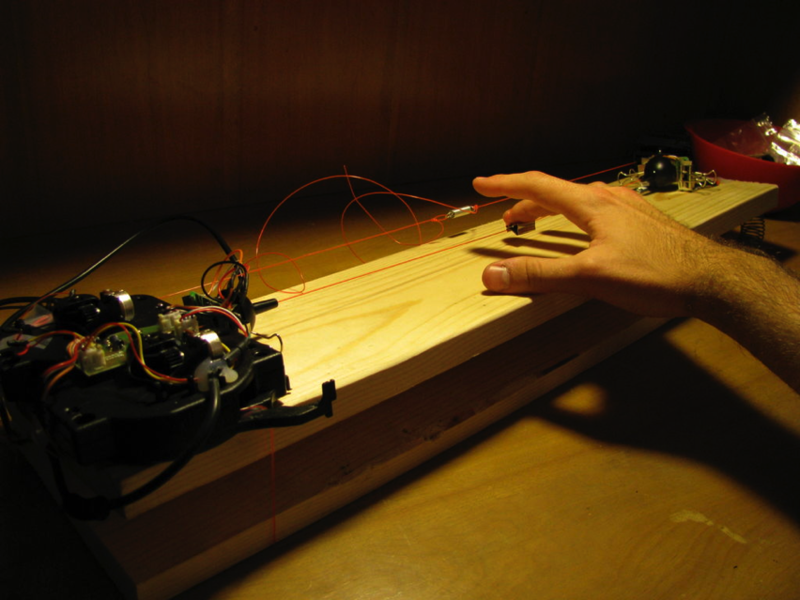 The Ondes, on the other hand, employed a ribbon-controller composed of a looped string with a ring tied in the middle in which one placed one’s finger and slid the ribbon back and forth to control pitch. In later models this controller was mounted parallel to a keyboard so that the location of the ring, or “la bague,” directly corresponded to the notes above it. This configuration allowed for greater accuracy than the finicky Theremin controller and was more intuitive to musicians familiar with the traditional keyboard. With this project I sought to produce an easy-to-make, cheap, digital controller inspired by the Ondes Martenot. Like the Ondes, I wanted the controller to give continuous and fluid pitch adjustments, a deep volume control, and offer a range of timbres.